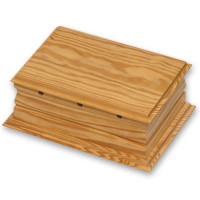 Burial-at-sea double size ashes casket. Enough space weights (not supplied) and ashes. Eight discreetly drilled holes for air release and submersion. Exterior dimensions (in cm) 28W x 33L x 17H.